If you're looking for a custom looking switch that also has a look of quality, you've found your solution. 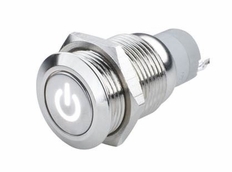 These flush mount switches can control any 12 volt accessory(s) (up to 3 amps per switch) and feature a glowing power icon when turned on. Once installed, push the flush mount button once to power whatever is hooked to the switch. Push it again to turn it off. Perfect for controlling aftermarket lighting, fog lights, or any other accessory. To install this switch you'll simply drill a 5/8" hole, slide the switch into the hole, screw the metal back onto the back of the switch to hold it into place, and then connect the wires on the back of the switch. The face of the switch is 3/4". Available in the following colors: "White 2009-001" "Blue 2009-002" "Red 2009-003" "Green 2009-004" "Amber 2009-005"